Frequency distributions are a simple way of organizing data based on how many each item has occurred. This can be used for individual values or for age ranges. Count the number of scores at each value and write those numbers in the frequency column. Let’s work through these steps one by one. The first step is to establish the highest and lowest scores. In this example, the highest score is 18 and the lowest score is 14. Creating two columns, we’ll call the first column “Student Age” and the second column “Frequency”. As you can see, each of the values occurs four times, except for the age 17 which occurs five times, and the age 18 which only occurs twice. From this data we can begin drawing rudimentary conclusions about the individuals in the sample. For instance, this group is relatively evenly distributed, except for 18 year olds which are under-represented. If your data exists in a range, you can also create a grouped frequency table. This is similar to a regular frequency table but is often used for data where there can be many specific values (for instance, recording the speed at which a person performs a task can result in values that go into the millisecond.) In cases like these, grouped frequency tables are helpful. It is slightly more complicated to put together. Before we start, let’s go over some definitions. What “under 1.5” means is that any value between 0 and 1.499 would qualify, but it is worded this way to simplify things. How did we decide on the intervals here (e.g. 0 to 1.5, 1.5 to 3 and so on?) We used something called the 2k guideline. So, in this example we could use only 4 intervals if we needed to, but the authors of the set (which came from a statistics textbook) chose to use 6 to make the data easier to see. Ideally you want the number to be between 5 and 10. To determine the best distance between the intervals (in this case they’ve chosen 1.5), you can take the range (which is the highest value minus the lowest value) and divide it by the number of classes. Let’s assume the highest value was 8 and the lowest value was 0.1. Our “distance calculation” would thus be: 8 – 0.1 / 6 = 1.31. Again, the authors chose to use a simpler value to make interpreting the data easier. 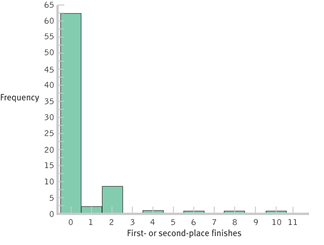 Cite this article as: MacDonald, D.K., (2015), "Frequency Distributions," retrieved on April 20, 2019 from http://dustinkmacdonald.com/frequency-distributions/. This entry was posted in Math and Statistics and tagged statistics. Bookmark the permalink.